The last two days are left before the end of the Dakar Rally 2019. The Czech-Spanish crew consisting of Ales Loprais, Ferran Marco Alcayna, Petr Pokora and their Tatra Jamal #507 continue to struggle for the final rank among the top six in the truck category. The people and the truck have covered eight stages, each ever more demanding than the previous ones. But that is Dakar in it its true form of the most famous marathon rally which never gives anything to anybody for free. The Instaforex Loprais Team had to pay a lot of hard work for anything they achieved, including on Tuesday. The eighth stage of the Dakar Rally took the whole competition fleet from San Juan de Marcona back to Pisco. Its special stage 360 km long was the second longest of the whole race for the car and the truck categories. 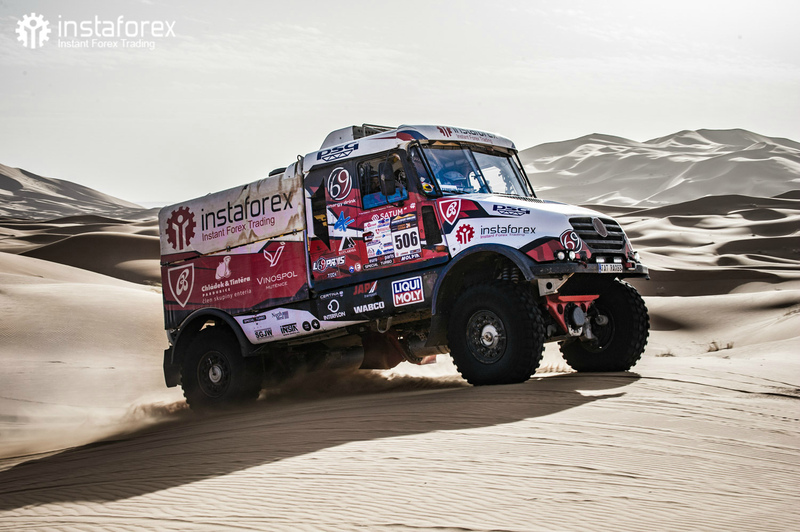 Its beginning provided racing on quick pistas and its end thrust the crews among the giant dunes of the Ica desert. “I wanted to donate today's stage to myself as a present. I planned to speed up along the way until the finish and we did indeed at the beginning. The start was fantastic, and we were really good. We flew over the pistas and kept overtaking some of the hot favourites such as Sotnikov or Van Genugten,” describes Ales Loprais the opening part of the special stage. However, the crew of the Instaforex Loprais Team was not allowed to enjoy the spell of racing in the beautiful dunes to the full. The mechanics also continued working. For them Dakar means work late into the night and only minimum time to sleep. These team members, without whom the racing would be impossible, can at least be pleased by the fact that on Wednesday they do not have to travel anywhere for on 16 January the second loop stage is on the agenda. The stage will encircle Pisco and its special stage will be 311 km long. The race trucks will start for it in pairs like in stage five.